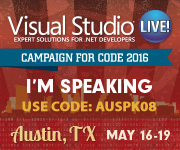 I’ll be speaking at Visual Studio Live!, May 16-19 in Austin. Surrounded by your fellow industry professionals, Visual Studio Live! provides you with immediately usable training and education that will keep you relevant in the workforce.